Please note there is no longer access to Research Park Drive via the back of the Hospital. We advise that you access the Hospital and Clinic car parks via Talavera Road. Macquarie University Train Station Upgrade will commence on 30 September 2018. Please find some important information below. A valet car parking service will be available at the Hospital for patients and visitors. 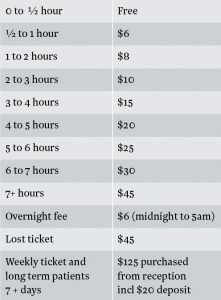 The cost is $25 for a maximum of 4 hours parking. For more information please call 02 9812 3000. Keoride is a new on demand public transport service operating within a 7km radius of Macquarie Park which will pick you up and drop you off 100 metres from your destination. For more information please visit keoride.com.au or call 1800 536 7433. Increased congestion is expected on the roads during peak times. Those travelling on the roads are encouraged to allow to extra travel time. Sydney Metro Northwest will open in early 2019. This mean mean a faster, safer and a better connected train service for Macquarie Park. Plan your trip and find the best route to Macquarie University Hospital for you, click here to go to 131500.com.au, the best transport site for people on the move in New South Wales. This is a ‘user pays’ car park, therefore charges are applicable in the hospital underground parking bays. Please note pay and display parking applies outside the clinic from Monday to Sunday 6am to 8pm. Discounted parking rates are available for oncology and sleep study patients. Please contact reception for more information. Reception hours are from 6am to 8pm Monday to Saturday and 7am to 8pm on Sunday. Clinic above ground parking mobility parking is free of charge in all bays when a proof of RMS Mobility Parking permit is displayed. Hospital underground parking: mobility parking is free of charge. Please present your parking ticket with your RMS Mobility Permit to reception staff for validation. Reception hours are from 6am to 8pm Monday to Saturday and 7am to 8pm on Sunday. If you are unsure of where to go once you arrive at the hospital, you will find a electronic interactive map called a kiosk located at the front entrance. Alternatively you can ask for assistance at the main reception.